• The fitting takes eleven readily available SES type light globes, with separate switching compatible between each tier. • Complete with custom brushed chrome ceiling canopy. 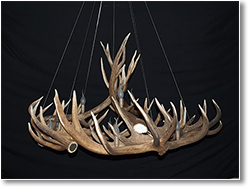 • Included is up to five metres of suspension wire and cable. Longer cable available on request. • All wiring has been carefully concealed within the fitting. • Each fitting has been individually numbered and is unique. • The fitting takes five readily available SES type light globes. • The fitting takes 9 readily available E14 Type light globes, Max 40w each. 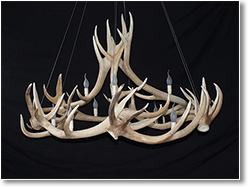 Price varies due to total number of antler points. • Approx 600mm diameter, though this fitting can be made to larger diameters on request. Dependent on availability of materials. • The fitting takes a single E27 or B22 light globe (may vary with each fitting). Price: from $4000 inc GST for a 600mm diameter. To be released August 2015.